Ο πρώτος λόγος, εκφωνήθηκε στο κλείσιμο της 12ης ετήσιας συνεδρίασης της Παγκόσμιας Τράπεζας, τον Οκτώβριο του 1957 στη Νέα Υόρκη, όπου ο Ξ. Ζολώτας παραβρέθηκε ως Διοικητής της Τράπεζας Ελλάδος. Ο Ξενοφών Ζολώτας ξεκίνησε την ομιλία του στα αγγλικά, και τη συνέχισε επίσης στα «αγγλικά» αλλά με αποκλειστικά ελληνογενείς λέξεις, αν εξαιρέσουμε κάποιες λίγες αναπόφευκτες αγγλικές, δηλαδή άρθρα, προθέσεις, συνδέσμους και βοηθητικά ρήματα. "Kyrie, I eulogize the archons of the Panethnic Numismatic Thesaurus and the Ecumenical Trapeza for the orthodoxy of their axioms, methods and policies, although there is an episode of cacophony of the Trapeza with Hellas. With enthusiasm we dialogue and synagonize at the synods of our didymous organizations in which polymorphous economic ideas and dogmas are analyzed and synthesized. Our critical problems such as the numismatic plethora generate some agony and melancholy. This phenomenon is characteristic of our epoch. But, to my thesis, we have the dynamism to program therapeutic practices as a prophylaxis from chaos and catastrophe. In parallel, a Panethnic unhypocritical economic synergy and harmonization in a democratic climate is basic. I apologize for my eccentric monologue. I emphasize my euharistia to you, Kyrie to the eugenic and generous American Ethnos and to the organizes and protagonists of his Amphictyony and the gastronomic symposia". Kyrie, it is Zeus' anathema on our epoch for the dynamism of our economies and the heresy of our economic methods and policies that we should agonize between the Scylla of numismatic plethora and the Charybdis of economic anaemia. It is not my idiosyncrasy to be ironic or sarcastic, but my diagnosis would be that politicians are rather cryptoplethorists. Although they emphatically stigmatize numismatic plethora, they energize it through their tactics and practices. Our policies have to be based more on economic and less on political criteria. Our gnomon has to be a metron between political, strategic and philanthropic scopes. Political magic has always been anti-economic. In an epoch characterized by monopolies, oligopolies, monopsonies, monopolistic antagonism and polymorphous inelasticities, our policies have to be more orthological. But this should not be metamorphosed into plethorophobia, which is endemic among academic economists. Numismatic symmetry should not hyper-antagonize economic acme. A greater harmonization between the practices of the economic and numismatic archons is basic. Parallel to this, we have to synchronize and harmonize more and more our economic and numismatic policies panethnically. These scopes are more practicable now, when the prognostics of the political and economic barometer are halcyonic. The history of our didymοus organizations in this sphere has been didactic and their gnostic practices will always be a tonic to the polyonymous and idiomorphous ethnical economies. The genesis of the programmed organization will dynamize these policies. Therefore, I sympathize, although not without criticism on one or two themes, with the apostles and the hierarchy of our organs in their zeal to program orthodox economic and numismatic policies, although I have some logomachy with them. In my epilogue, I emphasize my eulogy to the philoxenous autochtons of this cosmopolitan metropolis and my encomium to you, Kyrie, and the stenographers. 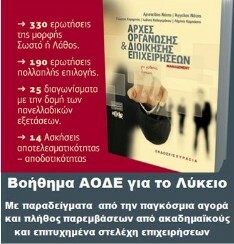 Αναρτήθηκε από ΓΙΩΡΓΟΣ ΚΑΜΑΡΙΝΟΣ economics.edu.gr στις 8:22 π.μ.